ONE CLOUD is the latest offering from three of the best companies known in the Software Industry. SAP, the world’s best business software. 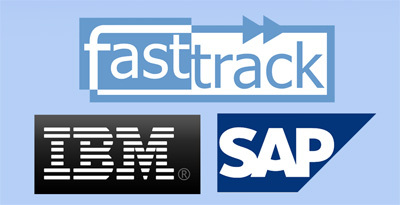 FASTTRACK, the best SAP Consulting Partner. IBM, the best in Hosting Infrastructure. ONE CLOUD is the latest offering from three of the best companies known in the Software Industry. IBM, the best in Hosting Infrastructure. SAP IS NOW ON CLOUD. Being responsive to market demands means you need to revolutionize the way you do business and embrace the future of the CLOUD. ONE CLOUD is a Subscription Based Hosting that gives a new licensing and delivery option for SAP Business Solutions. It allows a customer to pay a subscription for use of an SAP Solution that is hosted and managed by an SAP Partner and pay a flat monthly fee on a minimum of 3-year term. • No CAPEX Investment. No Upfront Cash. • Customers can invest their money in sales, marketing, R&D, manufacturing and other activities that will produce higher return. • No need to build your own Solution Infrastructure from Servers, to Networking Equipment, and IT Administration Team.